“House of Creation” – a 5000 m2 building with a 2500 m2 underground bunker in a 2 ha closed territory. The period of the cold war. Arms race between the two superpowers. In 1978, by order of Leonid Brezhnev, General Secretary of the CPSU, backup TV stations began to be constructed throughout the USSR; these stations were intended to replace existing ones in case of nuclear war with the USA. The first such station – a secret facility – was built in the village of Sofrino, near Moscow; the next in Tashkent. Vilnius was the third city in the territory of the USSR where an alternative TV station was built. Minsk in turn learned from the building of the station in Vilnius. The experts from Moscow searched for a long time for a site near Vilnius that met all their requirements – the facility had to be totally secret, to withstand the impact of a nuclear bomb, to have direct telephone connection with the Central Committee, and to be constructed near a railway. Communications cables had to connect the station with a radio and television relay station as well as with a reserve node of communications. A place was found at Dubingiai lake, but it appeared to be unsuitable, because the lake was too near and communications cables were too far away. A 2 ha territory was chosen in Naujasodė village near Nemenčinė and bores were made along its whole perimeter for ground inspection. The place turned out to be suitable. However, when ground excavation works started, water appeared in the middle of the territory. The facility had to be designed all over again – drainage lines had to be constructed so that water would flow to the Neris River via an underground watercourse. The main construction works of the secret facility, which was called “Dom tvorchestva” (“House of Creation”) in the documents, were started in 1983. The lower floor of the bunker was 4 m below ground and the upper one under overground embankments. The thickness of the walls of the bunker is about half a metre; the roof, 60 cm; and a 1 metre layer of soil was placed on the roof. The roof can support a weight of 2 kg/cm2, i.e. the roof is twice as thick as provided for in the standards to withstand the impact of a nuclear bomb. A stand alone heating system, sewerage and artesian bores were constructed in the facility; they all still function today. After completion of construction of the “House of Creation”, LRT (Lithuanian Radio and Television) provided constant employment for 15 people here: plumbers, stokers, electricians, cleaners and guards. The OMON officers spent 3 weeks in the bunkers until they used up the “mobile reserve” stored here – stores of foods and cigarettes. During those three weeks, TV equipment – dictaphones, lenses, cameras – vanished from the bunkers. When the OMON officers retreated, a division of the Ministry of the Interior was sent from Snieckus. A post was constructed in the tower and a gunner constantly kept watch there. 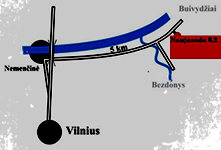 During the USSR August putsch, “special situation” was declared in the facility: the soldiers surrounded the whole site with defence blocks, as they expected to be attacked by Lithuanian volunteer forces. The division abandoned the “House of creation” only on the 24th of September, 1991, when the Soviet Army retreated from Lithuania. Since 1991, this facility, which is owned by LRT, has not been used. In 1996, a delegation from the Prison Department visited this place. The possibility to locate a prison in the “House of Creation” was considered. When the bunkers were inspected, it turned out that the conditions are not suitable for prisoners. A few years ago, Hungarian television made a documentary “Bunker” comparing the Lithuanian “House of Creation” with the famous Andrej Tarkovsky film “Stalker”. Back to the USSR – easy way!